Psydrozon is a giant robot created by Evilfatsozon and controlled by Pretzel Head. Psydrozon has one eye and two swords and he chops down buildings. His body is now used by Axe Cop and Dinosaur Soldier to fight crime. Powers: robot powers, one eye, two swords. Recent Appearance: Page 200 - Stab! Telescope Gun Cop has a gun that can elongate out and shoot people directly in the face even if they are across the room. His gun also has a flash light. TGC went to a try out to join Axe Cop and Dinosaur Soldier, but they chose to not let him join the team when they procured a giant robot suit and decided they had all the power they needed to fight evil. Embittered by the experience, TGC took Uni-Baby and used her powers to go back in time and poison Axe Cop and Flute Cop's parents' candy canes. He was finally defeated in a barrage of lemon and avocado grenade bombs in episode 3. Powers: telescope gun, flash light. Recent Appearance: 5 Years Later! The Smartist's were the parents of Axe Cop and Flute Cop. They only ate Candy Canes. One day Telescope Gun Cop went back in time and poisoned their candy canes and killed them both. 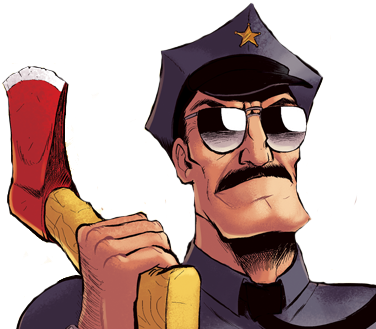 It was their death that inspired Axe Cop and Flute Cop to grow up to fight crime, and eventually kill Telescope Gun Cop (though they had no idea he killed their parents because they bonked their heads). Gobber Smartist was a known baby eater, and she encouraged a young Axe Cop to eat them because they are healthy. Powers: only eat candy canes.